Keep in mind that going from dry hay and grain to lush, green pasture is a drastic change in diet and may increase the risk of founder or colic. Horses that are in the pasture full time will gradually become accustomed to the emerging green grass as it comes up. But horses that haven’t had green grass should only be allowed to graze for an hour or two at first, then gradually increase grazing time by an hour every couple days until the horses are out full time. It is also a good idea for horses to have eaten dry hay prior to turnout so they are not overly hungry. 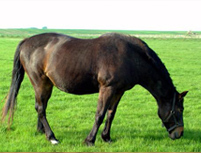 Individual horses will have different tolerance levels to the diet change and the nutritional profile of the grass, so a slower introduction is usually better. This entry was posted on Friday, March 20th, 2015 at 1:28 am	and is filed under Uncategorized. You can follow any responses to this entry through the RSS 2.0 feed. Both comments and pings are currently closed.